I’ve come across a mystery. I recently acquired a manuscript map of France with a (from what I can discern) mountains comparative panel at the bottom. Unfortunately I do not read French so I have to make some guesses about it. It is on very thin paper, possibly onionskin paper, mounted on a secondary thicker page. The lines on the map are fine and well executed. 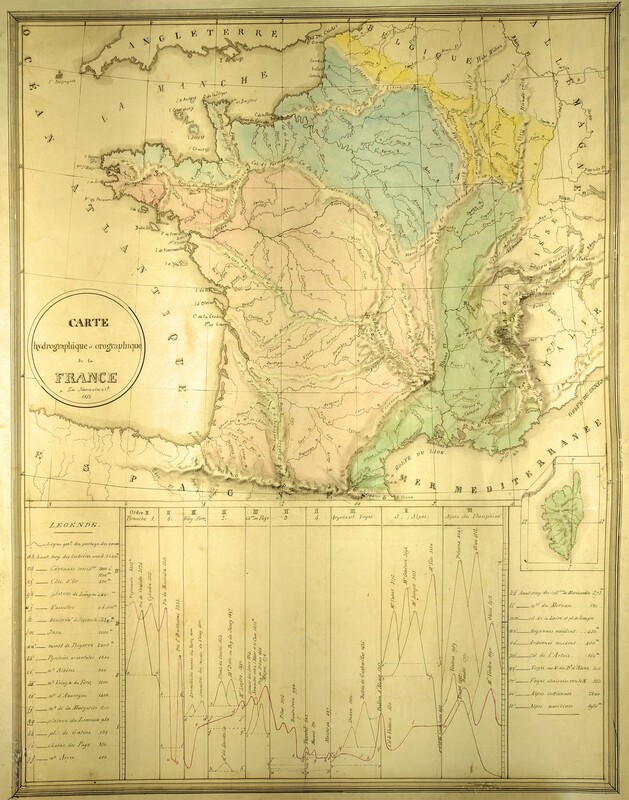 It appears that drainage basins are shaded in pastels (possibly political divisions–perhaps a reader with better knowledge of France can clarify, but because the shaded areas follow mountain ranges, I suspect they are watersheds). 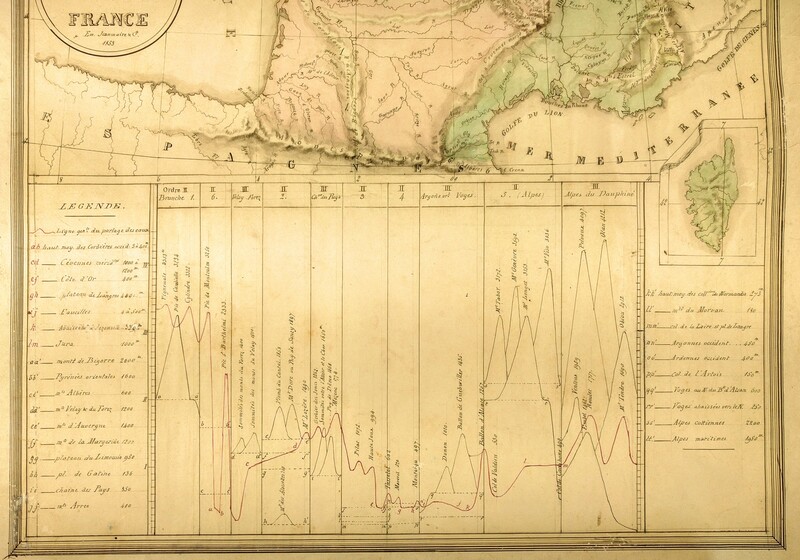 The bottom of the map features a comparative panel of mountains similar to an anonymous Portuguese map from 1824, the orological line, along with a hydrological line; the mountains are grouped by range in a valley sort. The cartouche bears “Em Jeanmaire & C 1853”, telling us an approximate production date (approximate because this is more of a “no earlier than” date). The thin paper suggests that all or part of the map was a tracing of another map. Residual, faint lines are visible in the border, as well as overruns, further indicating this is a manuscript piece. The orological line clearly shows the heights of mountains within the range. The line both takes the shape of peaks and the corresponding heights on in the adjacent data tables are consistent with mountains. The hydrological line is vexing. I suspect it is the heights of rivers, but my attempt at translating “parlage” turned up “chatter”, which, without understanding French, doesn’t make sense to me. If you understand French, please fill in some of the gaps for me! Want to learn more about comparative views? Check out my ebook!